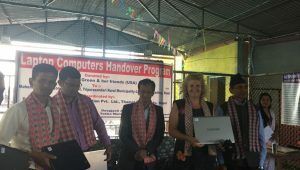 Miss Camilla Siig had helped to three social institutions as following which have been working on the behalf of the needy people of Nepal. 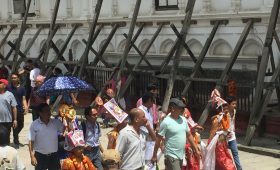 To Shree Shradha Women School(Kathmandu). 28th Aug’ 2018, Miss Camilla Siig (UK) donated Rs.20, 000.00(In words: – Twenty Thousand Rupees only to Shree Shradha Women (SSW) School in Kathmandu. 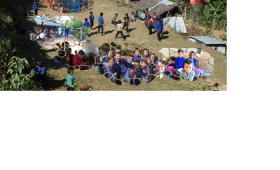 SSW School was established before ten years ago. SSW School has been providing formal education teaching women students from 11 AM to 3 PM. SSW school couldn’t pay high salary due to poor economic condition of the school. However they need a qualified science and math teacher. According to the agreement with School, donated amount helps to give salary to science teacher and math teacher. Now, women students in women school get opportunities to study with professional science and math teacher. It helps SSW school to meet its campaign of standard the education on the behalf of needy women students. More than 50 women student from 10 years to 75 years old women student have been benefited. On 19th of Aug’ 2018, Miss Camilla Siig donated Rs. 13,500.00(Npr Thirteen Thousand five hundred only) to Dwarf Association of Nepal with propose of developing its website. 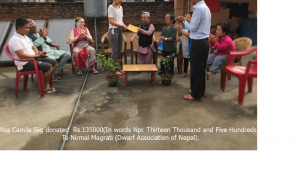 We all members of Dwarf Association of Nepal offered a huge thank to her and her friends who donated to do something on the behalf of the needy dwarf community. Thanks a lot to Pristine Nepal Treks and Expedition Pvt. Ltd(Thamel,Kathmandu) for coordinating with Miss Camilla Siig. This help will be used for domain charge and web design. On 19th of Aug’ 2018, Miss Camilla Siig donated Rs. 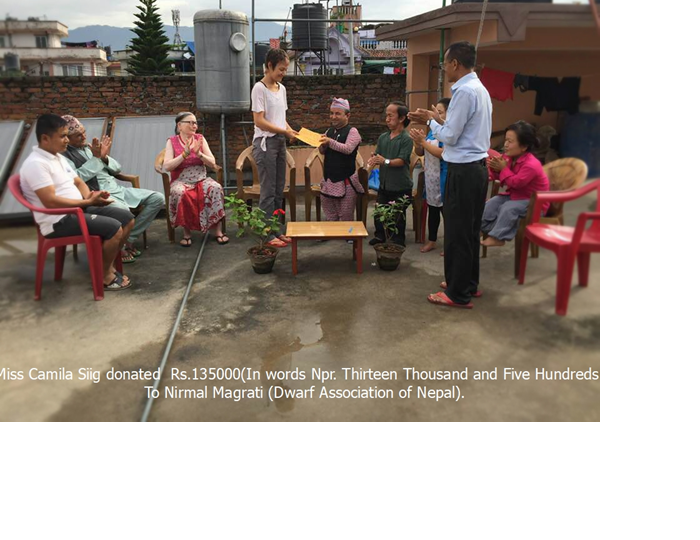 13,500.00( Npr Thirteen On 19th Aug’2018, Miss Camilla Siig(UK) donated Rs. Thirteen Thousand five hundred only to Dwarf Association of Nepal(DAN) with propose of developing its website. We all members of DAN offered a huge thank to her and her friends who financial support to make website on the behalf of the needy dwarf community. 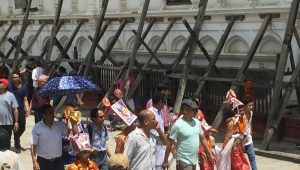 Now, the DAN has already got the website (www.dwarfnepal.com). It was hosted on 30th Aug’ 2018! More than 10,000 dwarf people in Nepal felt proud that they have had the website now. Thousands of people from all over the world could see now their actives and program on one line! DAN was established in 2003 AD before 15 years ago but they didn’t have the way of publishing official site. 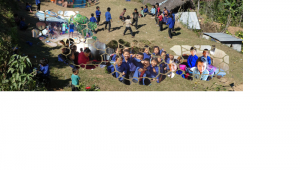 This website helps to share the need of Dwarf people of Nepal and get opportunities to show their objectives, programs and mission as well. Early in the morning, on 17th Aug’2018, Camilla Siig and the free-volunteering Nepal team gather together in EPSA-Centre. From the local market purchasing(Npr Twenty one thousand rupees only) the biscuits, tea, rice, lentil, noodle, salt, pasta and other items carried in Centre and distributed to the needy girls who are staying and getting training and working as well in the centre. Ladies in the centre became grateful to Camilla and her friends for her kind support. More than 20 disable ladies got benefited from this kind help of Camilla’s team. Prev PostMajor progress in the “Computer Labs for Schools” program! Have a look at our new design!